So Taylor, one of our readers, submitted this picture with the request that we post it and ask if anyone had any info on it or its history. However, Taylor didn’t tell us where the house is located. So below is the email we received. We replied asking for more info, but haven’t gotten a response yet. Anyone recognize or know anything about it? So, about four years ago now, my aunt lived in this house (photo attached) with my uncle and their children. The house used to look nothing like it does in the picture, clearly someone cleaned it up (it is now for sale). It was rusted, there was an old fashioned coal oven in the kitchen, and the basement did not have a floor. Just dirt. They told me it was notoriously haunted but I disregarded everything they told me. The creepiest thing about the house is inside the ancient metal oven, the man who built the house carved “I put blood sweat and tears into this house to make it a suitable home. I hope (hope was scratched out and replaced with ‘pray’) that it does the same for you.” Seeing that gave me goosebumps, and I felt very uneasy in the basement but I thought nothing of it. A few weeks after that, I was called over to babysit while they spend a night out of town. I agreed and all was well. The kids were asleep when I got there so I sat on the couch. I heard a loud thump coming from the basement but I ignored it and turned off the lights and went to sleep until I woke up because, not just one, but ALL of the kids’s toys were making noise. I took the kids outside until my aunt got home! Anyway, I was hoping you would post this to your site because I’m so curious about the house, who else has lived there, if anyone else has had weird things happen there, etc. My aunt moved out shortly after because the oven made odd noises. But mainly I’d like to know what this house’s legend is, if there is one. 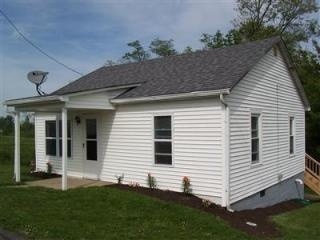 The house is located in Williamstown KY. I believe it’s on Arnold road but I’m not sure. She lived there when I was fourteen and I haven’t been back that way since that night. Oh wow. It’s a shame we don’t know where this place is, but I understand why that info wasn’t provided. I’d love to spend a night there! I only stayed there one night and I dont recall laughing but the toys went off and I felt really nervous and dizzy so I left.